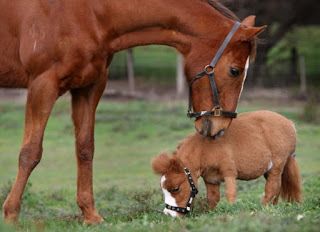 Miniature horses are found all over the world and come in various colors and coat patterns. They are the size of a very small pony, many retain horse characteristics and are considered "horses" by their respective registries. Classically elegant, gentle by nature and appealing to people of all abilities, this small and unique equine - standing no taller than 38 inches, they are generally quite hardy, often living longer on average than some full-sized horse breeds; the average life span of miniature horses is from 25 to 35 years. Miniature Horses will normally require a daily ration of grain and hay.